After having a strict no spending Wednesday (after a few too many cocktails and drunken pizza last night) I thought I'd spend my evening going virtual shopping. Like window shopping but in your onesie with a cup of tea, although I do personally think this attire should be acceptable for outside shopping also...but anyway here are the five things I found that I am now lusting after this month. 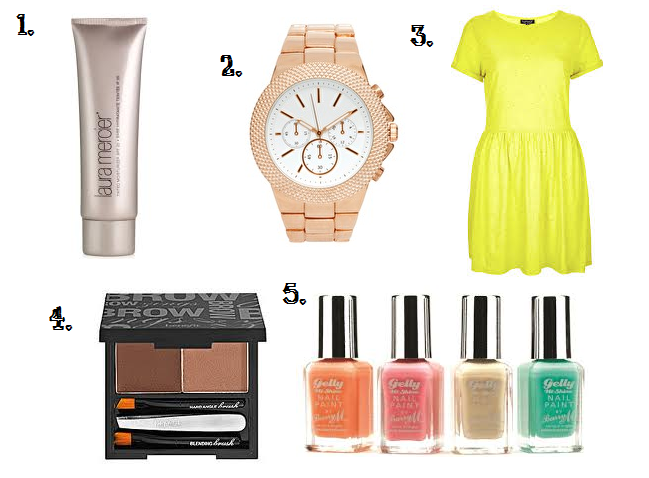 It's quite a Spring themed wishlist as I'm refusing to acknowledge the snow relentlessly falling outside! As was suggested by the cocktails and pizza reference at the start I had a really fun night out last night at an event called 'swing into spring', which as you might guess was swing themed. Cue 1940's curly hair, pretty dresses and a good old scouse brow! Tonight though I'm just sorting through some job and internship applications, I sent my first one off today and I'm glad I've finally got the ball rolling for what I'm going to do with my life come June! I loooove this wishlist. I have a few of the Gelly nail paints and I looove them, they last on the nails for quite a while too! Desperate to try those gelly polishes! I love that watch too! Wow, that's cool! I'd love to try them too but they don't sell Barry M in Germany unfortunately.. Very nice choices, the yellow dress is so pretty! Love the watch, and i need more Gelly polishes got my eye on Greenberry! I'm dying for the Barry M gel varnishes too! The hazy blue colour looks amazing and would be so on trend for s/s13! I've got Benefit Brow Zings but I can say that more often than none I still just use a brown eye pencil to fill in my brows, the Brow Zings makes them a bit too shiny and greasy I think, it's well worth a try though might just be my awful brows! Love your blog!